Med-Associates (St. Albans, VT) operant behavior chambers housed in sound-attenuating ventilated boxes. Chamber floors consist of stainless steel rods above a litter pan. The front panel contains three nose poke holes, each mounted 1.27 cm above the floor. A 0.50-cm diameter yellow LED light is centered 1.91 cm above either the left-most or the right-most nose poke hole and is designated as the active hole (counterbalanced between animals). Accuscan (Columbus, OH) automated activity monitors consisting of a 40 x 40 x 30 cm clear acrylic plastic test cage placed inside a monitoring unit that includes 8 or 16 evenly spaced photocells. I. Preparation for training Phases 1 and 2 (see Figure 1 below): in "go training trials" the mouse learns to respond to a "go" light cue signal. a. Mice (Cohort 1) are food restricted at 90% their free-feeding weights for 48 h prior to and during training, as well as subsequent testing. b. Go training is conducted in operant chambers equipped with stimulus lights positioned above 2 illuminated nose-poke apertures. c. The nose-poke apertures are placed at eye level to the mouse and mounted on either side of the food cup. d. Food rewards in the form of liquid 10% sucrose is automatically dispensed at a speed of 3.33 rotation per min (RPM). Figure 1. Schematic illustration of the training periods (Go tasks only) and the experimental Go and No-Go test periods. Note that the size of the pie charts correspond to the relative duration of each trial during training-Phase 1 vs. Phase 2 (panel A), and during experimental Go vs. No-Go test trials (panel B). a. In Phase 1, training begins with the presentation of the "go signal," which is a light illuminated above the nose-poke aperture. Nose poking behavior during a 30-s light cue is reinforced with 19.95 µL sucrose. b. After the 30-s light cue, a new trial is automatically started. c. Mice that earned 30 or more reinforcers within 40 min in 2 consecutive sessions are advanced to Phase 2. Within Phase 1 training, a maximum of 60 Go trials are given per session, and for up to 35 total sessions. d. Mice that fail to advance after 35 sessions are dropped from the study. e. In Phase 2 training, nose pokes during a 10-s light cue is reinforced with 19.95 µL sucrose. f. After 10-s light cue, a new trial is automatically started. g. Mice that earned 30 or more reinforcers within 40 min in 2 consecutive sessions are entered in the experimental phase. Within Phase 2 training, a maximum of 60 Go trials are given per session, and for up to 30 total sessions. h. Mice that fail to advance after 30 sessions are dropped from the study. Figure 2. Schematic illustration of the operant chamber during training (Go trials only) and experimental (Go and No-Go) tasks. a. Go⁄No-go task performance is assessed using 16 identical operant chambers equipped with sound-attenuating ventilated boxes (see Figure 2 below). b. A 100 mA house light is mounted outside the chamber above the back wall. c. Nose pokes in inactive holes are recorded, but no experimental contingencies are applied to these nose pokes. d. Nose pokes within the active hole are rewarded with a liquid food delivered into a food cup using a pump at a speed of 3.33 RPM. e. During the precue period of each trial, the house light is illuminated variably for 9–24 s duration. f. Responses during the final 3 s of this period reset the trial to prevent premature responding from confounding interpretation of responding during the Go and No-go cues. g. The precue period is followed by a 5-s cue period, where one of 2 distinct cues (light or tone) is used to differentiate Go trials from No-go trials, respectively. h. During a Go trial, the light above the left or right nose poke hole is on (counterbalanced between subjects). A response clicker is used to signal the delivery of a reward. i. The first nose poke occurring during the Go period terminates the Go light-cue and is reinforced by 19.95 µL of sucrose solution. j. Mice are permitted 3 s to consume the reinforcer, and then given a 10-s inter-trial interval (ITI), during which the house light is turned off. There are 10 Go-task sessions, with 60 trials per session. k. During a No-go trial, a continuous 65-dB 2.9- kHz tone is played for 5 s during the cue period. l. During the No-go period a 19.95-µL reinforcer is delivered at the end of the period if there is no nose poke response, followed by the 3-s consumption period, and a 10-s ITI before the next trial automatically starts. m. During the No-go period, the tone is terminated and followed by an ITI without any reward in the event of a nose poke response. These responses during the No-go period are defined as false alarms. n. False alarms and precue response rates are recorded as the two main dependent measures of behavioral inhibition for the Go⁄ No-go task. o. Since responses during the final 3 s of the precue period reset the trial, the rate measure is used to adjust for potential differences among mice in precue time. Precue response rate is defined as the total number of responses made during the precue periods divided by the total precue time. p. During the No-go experimental phase, mice are subjected to a total of 10 sessions with a maximum of 60 trials per session. Submitting investigator's notes: "We conducted preliminary statistical analyses using ANOVAs with strain (genotype) as the between-subjects factor and sessions (6–10) as the within-subjects factor on each of the Go ⁄ No-go task measures. There were no statistically significant (all p > 0.05) main effects of session or strain x session interactions for any measure. Based on these findings, the data were collapsed across sessions and analyzed using univariate ANOVAs with strain as a between-subject factor. These early analyses revealed that some strains were not responding differentially to the Go and No-go signals. Data from The Jackson Laboratory indicated that for a subset of strains (C3H⁄HeJ, CBA/J, PL⁄J, SJL⁄J, and SWR⁄J), this was most probably resulting from a genetically determined blindness." Figure 3. Schematic of trial events and contingencies in the Go⁄No-go Test. MPD staff notes: Since light or sound cue response is highly dependant on visual or hearing ability, it is worth mentioning that C3H⁄HeJ, CBA⁄J, PL⁄J, SJL⁄J, and SWR⁄J are homozygous for the retinal degeneration 1 or Pde6brd1 (phosphodiesterase 6B) mutation which results in blindness within 3 wks of age, while 129P3/J, C57L/J, C57BL/6J, C58/J, DBA/1J, DBA/2J strains are homozygous for the age related hearing loss 1 or Cdh23ahl (cadherin 23, otocadherin) mutation which results in progressive hearing loss with variable onset depending on strain background. III. Locomotor activity. Because individual strain differences in general activity may affect performance on the Go⁄No-go task, locomotor activity is evaluated. a. Locomotor activity is measured in experimentally naive mice (Cohort 2) using 5 automated activity monitors. b. Horizontal beam breaks are measured and converted into distance traveled (in cm) via software analysis. c. Each test cage is housed in a black acrylic plastic chamber, lined with foam to attenuate external noise and equipped with a florescent light and ventilated by a fan at the rear. d. During testing, both light and fan are ON to provide illumination and low-level background noise. e. Each mouse is run for 2 consecutive days within each testing session consisting of 15 min (divided into 5-min bins for analysis). Submitting investigator's notes: "Measures of distance traveled on Day 1 provided a measure of response to the novel environment (Piazza et al., 1989), and the difference in distance traveled between Day 2 and Day 1 provided a measure of habituation to the novel environment (Mitchell et al., 2006)." a. Following completion of the locomotor activity study, mice are subjected to a 2-bottle sucrose preference study. 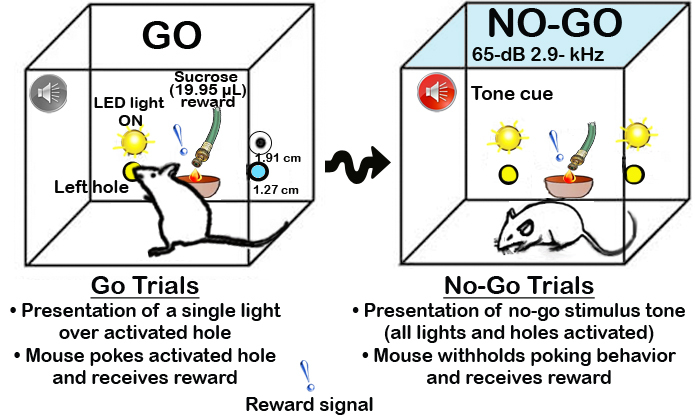 Sucrose preference (10%) is measured to assess potential differences in sensitivity to the rewarding effects of sucrose among the inbred mouse strains used in the Go/No-go experiment. b. Mice are placed individually in cages equipped with a metal wire top and two bottles- one containing de-ionized water and the other containing 10%sucrose solution. c. Placement of the sucrose and water bottles is switched daily to correct for potential side bias. d. Additional control cages without mice are placed on each mouse rack shelf to estimate daily leakage and evaporation. e. Leakage amounts are subtracted from the daily drinking values for each subject on that shelf. f. Likewise, mice are weighed daily. g. The total amount of each solution consumed is determined by weighing the bottle at the start of the experiment and every 24 hrs for 4 consecutive days. h. Sucrose consumption is calculated as grams of sucrose per kg body weight, averaged across days. i. Sucrose preference is calculated as average ratio of sucrose consumed divided by the total amount of fluid (water + sucrose) consumed across days. Submitting investigator's notes: "We excluded 10 daily drinking values because bottles leaked (1.4% of values), as shown by wet bedding under the drinking bottle and an almost empty bottle. Additional three daily drinking values were excluded, because negative consumption values indicated that there had been a data collection error (0.4% of values)." Operant chamber is an apparatus to study behavioral responses contingent upon receiving a reward following a specifically defined stimulus (light, sound, footshock etc, for a schematic example see Skinner's box).